Beef production is the production of beef and veal, i.e. the meat from cows, steers, bulls, heifers and calves. First we look at the differences between beef production to the production of other types of meat. Then we discuss the anatomy of meat, the growth of the beef animals and their carcass composition. The different methods of rearing beef cattle are discussed in later posts. What is beef? Beef is the meat from bovines, that is "cows" of different age, gender and breed. The beef you see in a market comes either from beef production, milk production or from a combined farm with both milk and beef production. In Northern Europe, for instance, nearly 90 % of all beed originates from the dairy industry. Compared with other animals reared for their meat, cows are relatively inefficient at transforming vegetation into meat protein. 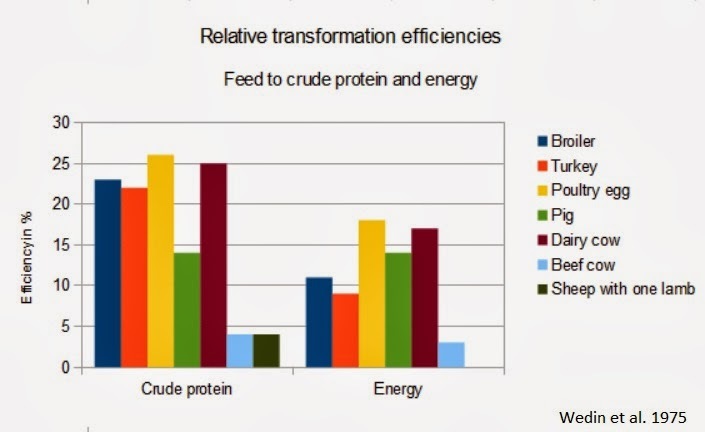 Dairy cows produce much protein and energy to their milk, but as meat producers they are even less efficient than beef cows.The chart on the left shows only the energy and protein in edible cuts. Energy in tallow, lard etc is not included. Growth can mean either the actual daily growth of an animal, the extra growth it puts on due to management and feeding, or the increase in edible cuts. For example: A calf grows 1500 grams a day (actual growth). Of that, 400 grams is due to heavy feeding (extra growth). After the calf is slaughtered one can then calculate backwards how much of the 1500g went to the edible meat (increase in edible cuts). Change in size, for example the weight, is an inaccurate measurement because it is affected by what the animal has eaten and drank. The weight of the digestive tract of a bovine varies tens of kilos during the day. The weight of a cow inceases most rapidly from birth until 6 months of age, when the growth slows and finally comes to an end at the age of 2-3 years. The model is very simplified, because bones, muscles, connective tissue and nerves have a very different rate of growth. This also affects the third measurement: the anatomical composition. First the animal gains mostly bones and nerves, then muscles and finally fat, all altering the anatomical composition of the carcass. Daily growth is measured either as the proportion of daily growth to the live weight, i.e. 1500g / 250kg = 0,006 %, or simply as g/day. Final weight of beef breeds varies from 350 kg (a Dexter cow) to 1400 kg (Charolais bull). Bulls grow 10-20 % faster than steers (castrated bulls), while steers grow as fast as heifers (Galbraith and Topps 1982). Changes in appeareance only describe how the different parts of the animal grow in proportion to one another. For example a calf has tall feet and a shallow chest, while a grown cow has shorter feet and very wide chest. Chemical changes describe the changes in the composition of the body. 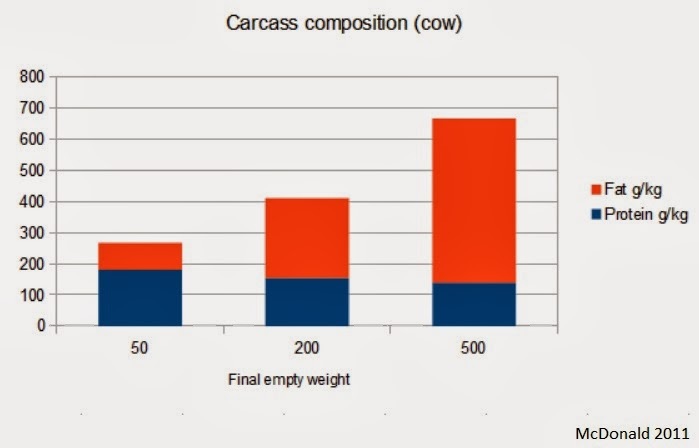 The higher the live weight, the more fat there is in a kilo of carcass, and therefore also the relative energy content increases. At the same time the relative portion of crude protein decreases. As with all young animals, first to grow are the bones and nerve tissue, with muscles next and finally body fat. Breed and gender also affect the carcass composition. Steers gain 10-45 % more fat than bulls, and breeds like Angus and Hereford are fatter than for example Limousin and Charolais. Note that breed does NOT affect the composition of the lean (fatless) carcass. 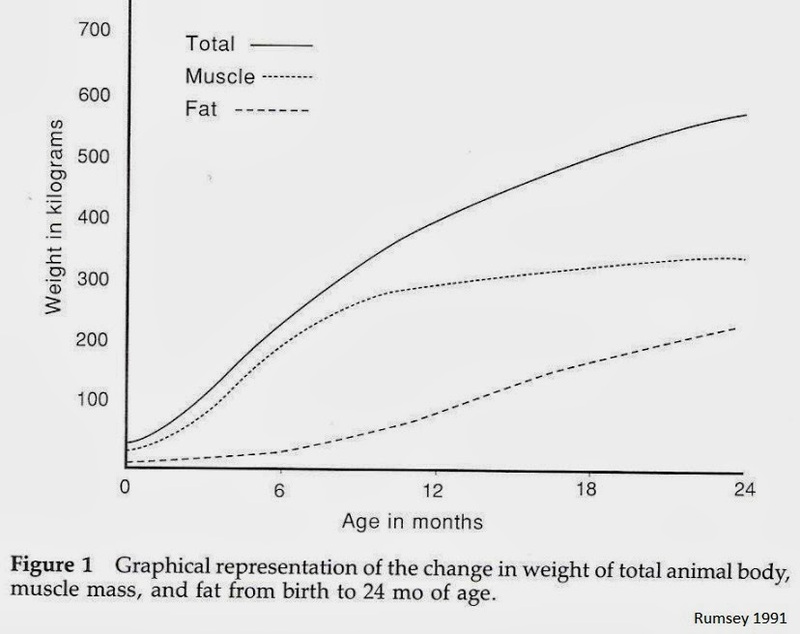 All in all, the growth of an animal is summarized in the picture below (Rumsey 1991). 30-40 % of the live weight of a bovine consist of skeletal muscles. The quality of edible meat is affected by the chemical, biochemical and physiological qualities of the muscle both before and after slaughter. Growth, feeding, animal handling and meat processing after slaughter also all have an impact on the quality of the meat.For bovines, 30 largest muscles contribute 75 % of the weight of all the muscles. The largest muscle groups are in the pelvic limb (hind quarters) with 28,5 % of live weight, and neck/thorax with 22,4 %. The anatomy of a skeletal muscle is shown in the picture to the left.The muscle is covered by epimysium, and consists of bundles of muscle fibres. The space between bundles is filled with perimysium, which has lots of nerves and blood vessels. Perimysium affects the tenderness of the meat. There is also fat between the muscle fibres, and this fat gives the meat it's marbling properties. Each muscle fibre is surrounded by endomysium, yet another type of membrane. Each muscle fibre in the skeletal muscles has several nuclei. Fibres are surrounded by a sarcoplasm, which is a membrane, and sarcolemma, which is a type of elastic connective tissue. One fibre consists of 1000-2000 myofibrils. The functional unit of a myofibril is called a sarcomere. 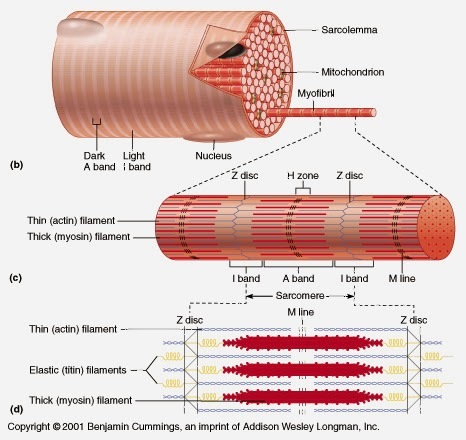 Sarcomere is where the muscle actually works, when thick and thin filaments of the sarcomere either slide closer or farther from a z disk (see the picture below). If the filaments become imbricated, the muscle constricts. When they slide farther apart, the muscle relaxes (returns to rest stage) or stretches. A very detailed video about the action potential and muscle activity can be found from Youtube. Marbling of the meat means the increase of intramuscular fatty tissue, which occurs at the finishing phase of beef cattle rearing. Marbling is more pronounced with strong, grain-based feeding. The actual level of marbling is determined visually after slaughtering by estimating the percentage of fat in a cut of meat. Fat is seen as white areas in otherwise red meat. The fat in the muscle is mostly based from de novo -fatty acid synthesis, which takes place in the rumen. The rumen biohydrogenates unsaturated fatty acids into saturated ones, so the fat of ruminating animals is more saturated than that of monogastric animals. For example, cattle have more saturated triglyceride 18:0 and less unsaturated 18:2 than pigs (Lawrence & Fowler: Growth of Farm Animals). Tenderness is affected by the type of collagen in the perimysium, the connective tissue between bundles of muscle fibres. More important than types or the amount of collagen is cross-linking between the collagen types. Both the cross-linking and insolubility of collagen increase as the animal ages. That is why the meat from old animals is more stringent than the tender meat of young animals. However, when cooking meat in high temperatures even tender meat becomes stringent due to heat-induced chemical changes in the collagen.